Great for those of you who always wanted to try scuba diving but don't have time for the 3-4 day certification course. Have your lesson in the confined environment, then take 2 1-hour dives at the beautiful coral reef just off the Florida Keys. Yes, snorkeling is great, but nothing beats the tranquil and amazing experience of being in the underwater world of the coral reef. Snorkeling and diving are available on the same boat. 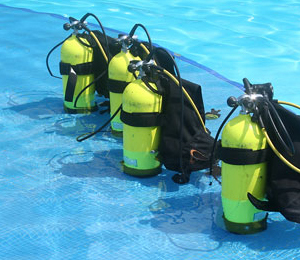 The Discover Diving Resort Course is a great way to experience diving. Less than 2 hours of dive training and you can hover weightlessly beneath the surface of our turquoise waters, at the only living coral reef in North America. Wholesome, fun, and educational, this adventure will be the highlight of your tropical vacation. The most precious asset of the Florida Keys is right at your doorstep. Includes a full day of fun ~ morning orientation, a confined dive session, afternoon 2-tank dive trip with instructor, all gear and boat trip. What is the Learn To Dive Resort Course? This is a quick and simple learn to dive program. Persons who have never tried diving before can dive without being certified. This course includes a short lecture, water skills practice & a two tank boat dive with your instructor. Each person doing the this course MUST know how to swim and be physically fit and able to pass the Discover Scuba Diving medical questionairre found here. Pick up is not provided on this activity. No, unfortunately only divers are allowed on certification trips. I have been to the Bahamas many times, but Discover Scuba Diving Resort Course Dive is one of my favorite trips! It includes everything that everyone should do here. As a Bahamas veteran, I can say only the best about this experience!